Jordan Spieth has become the new Hero World Challenge title holder after storming his way to a 10-shot win with an impressive 26-under par tally on the ultra-exclusive Isleworth Country Club course. The 21-year-old Dallas-born Spieth led from start to finish in carding a final round 66 in the Tiger Woods hosted event. 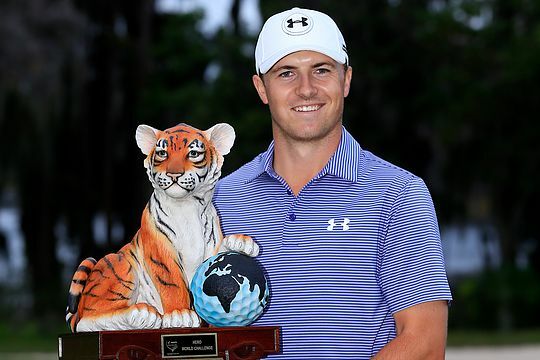 Spieth’s winning margin was the largest on any Tour this season eclipsing Martin Kaymer’s European Tour counting eight-shot success in capturing the US Open and three shots further under par than Lee Westwood’s seven stroke success at the Asian Tour’s Maybank Malaysian Open. Lowest victory tally in the 14-year history of the Hero World Challenge. Finishes one shot less than Tiger Woods all-time career best of 25-under par (2002 WGC – American Express Championship, Mt. Juliet. IRE. Spieth wins three pro career events in just two full seasons and some 18 months quicker than current World No. 1 Rory McIlroy. Moves to No. 9 in the world after a career high of No. 7 following his fourth place finish in the 2014 Masters. Is 53-under par for his closing three events of 2014 including 14-under par at the Dunlop Phoenix Open (Japan Tour), 13-under par in capturing last week’s Australian Open (Australasian Tour) and now 26-under par in Florida. “I didn’t really know what the game plan was really going to be when I woke up this morning. I’ve never been in this position to be really far out front starting the day,” said Spieth.